Late last year we learnt of the death of Sir. David Frost. A well respected, admired and talented journalist and interviewer. He was one of the few journalists who was well known on both sides of the Atlantic. You may also have known that Sir David was the master of satire – hosting ‘This was the week that was’ first for the BBC in the United Kingdom and then for NBC in America. But did you know that he was also a game show host. From 1987 to 2008 he entertained the British public every week by snooping into famous people’s homes and asking the question “Who would live in a house like this?”. The British public were hooked as they got to see famous people in a whole new light. The game show was most entertaining when the real personality of the famous person was completely different to their public image. In today’s Gospel reading, Matthew is likely, at least in part, writing for a Jewish audience. The original readers of the Gospel would have been very used to the rituals of the temple and the need to be seen to be following the law. The Hebrew Scriptures were full of rules that governed every aspect of life, from what you could do, what you could wear, to how you should worship. Being seen to do the right thing was a crucial part of life. But Jesus demands more. Not more rules, not more regulations but he demands that his followers live their whole life as one who has been touched by the love of God. So when Jesus say’s “Beware of practicing your piety before others in order to be seen by them; for then you have no reward from your Father in heaven” he is not so much saying do not do good works in public, but he is telling those first Gospel readers, and us today, Do good works, not for public recognition but because it is the right thing to do as a follower of Christ. Do it not for the public but for what is real inside. up in the morning, and for whatever reason I have felt the need to put a public mask on. Masquerade! Look around, there’s another mask behind you. Last night, in this very cathedral everyone was full of joy as we celebrated the Zydeco mass. 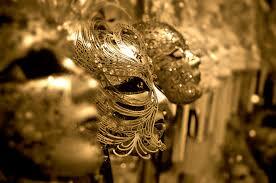 There was music, there was beads, there was dancing, there was fun, it was carnival, and there were masks. We joyously followed the tradition of a feast before our observance of Lent starts. But today, Ash Wednesday, we move into our season of Lent. A season in which we engage in prayer and self-examination. We are reminded that God had no need for masks. He sees us for who we are, and in an instant he is able to peel back our masks and reveal our true nature. God can see through our mask in an instant but often it takes longer for each and every one of us to remove our mask. So maybe one of the things that we can do this Lent is to work towards taking our masks off. To work at reconciling our outwardly public face with our inner heart and soul so that they both are filled with Christ’s love. As we start on our Lenten practice. As we move towards Jerusalem, journey towards the cross, we are all too some extent wearing a mask, we have a private and public. As our journey continues I pray that we will align our lives to be one with Christ, to hand him our mask. So that we reveal to those around us that God is in us, in all that we do, in all that we are. This Lenten discipline, to remove our mask and to align our life with God is something that we can do individually and as a church. It involves asking important questions, questions that require an honest answer and a commitment to action. Where is God in my life? When I come to church he is here, but do I invite him to walk through that door with me as I leave here and go into the world? The bible tells me to love thy neighbor as thy self. I help the homeless, giving money and even volunteering at some events we have here at church, but what do I do when I complain to my neighbor about the noise that the kids across the street make when their mum leaves them at home to work the night shift? (repeat) So that we reveal to those around us that God is in us, in all that we do, in all that we are. So that when we give our alms of time, talent and money it is not for public reward but is because we feel called to share the gifts that we have been given. So that when we pray, it is not just to be seen and to be heard but because we know that God hears and answers our prayers. So that when we fast it is not just for ritual but to help us walk and focus on our journey of Lent. The Good News is that God already knows what we are like without our mask and he loves us and accepts us already steadfast in that knowledge. Sir David Frost was never happier than when his contestant wore a mask. When the private was radically different to the public. But Lent is no a game show. We do not need to go through the keyhole. We do not need a mask. I pray that during this season of Lent, that when we walk with Christ fully reconciled to his love, that our true self shines through in all that we do and in all that we are. Amen.